Donetsk (Ukraine) (AFP) - A first air strike hit the main rebel stronghold of Donetsk in east Ukraine Wednesday, as government forces preparing to retake the city said 18 soldiers were killed in clashes with rebels. Kiev denied that it was behind the strike, which caused no civilian casualties, according to local authorities. Ukrainian forces have been making advances over the past months and have been tightening their grip around million-strong Donetsk, where pro-Russian fighters have hunkered down and pledged to fight to the death. 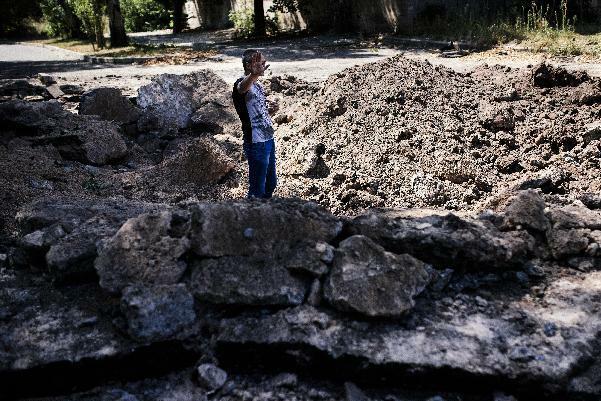 "The district of Kalininsky was hit overnight by an air strike... there were no civilian victims," the city council said in a statement, adding that one bomb had left a four-metre (13-foot) wide and 1.5-metre deep hole in the road. The site, located in a light industry area of warehouses, was seven kilometres (four miles) east of central Donetsk and the regional administration headquarters, held by the rebels. An AFP reporter on the ground saw two large craters in the road and another across some railway tracks about 100 metres away, as well as a severely damaged warehouse and a three-storey office building with all its windows blown out and the roof peeled back. The rebels said the strike occurred at 12:40am (2140 GMT). Police and firefighters milled about as well as international OSCE observers who have been monitoring the situation in Ukraine and were taking pictures of the scene, accompanied by a few rebels. An above-ground gas pipe was down and the city council said that engineers were working on another unexploded bomb. This was the first air strike to hit close to the centre of Donetsk since Ukrainian forces heavily bombarded the airport in May in their bid to halt the insurgency in the industrial east of the country. 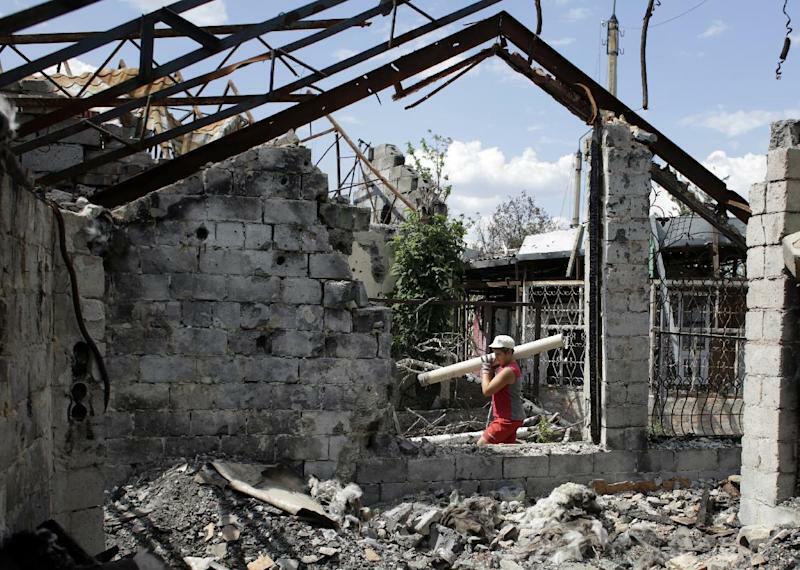 Andriy Lysenko, spokesman for Kiev's National Security and Defence Council, insisted Wednesday that Ukraine's military did not bomb built-up areas. But the strike came as Kiev signalled a harder push to retake the disputed area. 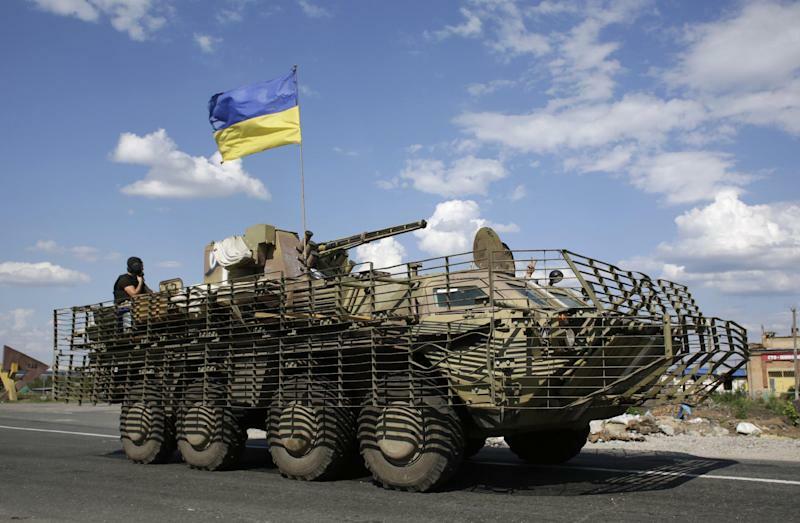 On Wednesday, the spokesman for the Ukrainian operation in the east, Oleksiy Dmitrashkivsky, told AFP: "The noose is tightening around Donetsk, Lugansk and Gorlivka," the main rebel strongholds. "Our forces are regrouping, maneuvring and engineers are strengthening the fortification of roadblocks, preparing for the liberation of these cities," he added. But amid these advances government forces have continued to face heavy bombardments, on Wednesday announcing that 18 soldiers had been killed and 54 injured in fighting over the past 24 hours, the highest daily toll in weeks. Three civilians were also killed overnight amid shelling on different suburbs of Donetsk, the city council said. This included two deaths already announced Tuesday evening. The conflict in east Ukraine -- which the Red Cross has already labelled a civil war -- has claimed over 1,300 lives since April, according to the United Nations. Civilians have been hit hardest by the fighting, with over 285,000 fleeing their homes over the past few months, according to the UN refugee agency (UNHCR), which warned of "a massive exodus" if fighting intensifies. Local authorities in Lugansk said Wednesday there was still no power, running water, phone connections or fuel, while food supplies were running low and rubbish disposal was becoming a growing concern. The refugee situation also sparked a new clash at the UN in New York on Tuesday, as Russian Ambassador Vitaly Churkin deplored the situation in east Ukraine as "disastrous" and called on the international community "to take emergency measures to improve the humanitarian situation" there. US Deputy Ambassador Rosemary DiCarlo struck back that Moscow was not entirely faultless in this crisis, adding: "Russia can stop all of this." The crisis in Ukraine has seen tensions between Washington and Moscow soar to their highest point since the end of the Cold War, with the US and European Union slapping punishing sanctions on Moscow over its alleged support for the rebels. On Tuesday, Russian President Vladimir Putin ordered his government to draft a response to the sanctions, which have already forced the low-cost subsidiary of national carrier Aeroflot to ground all flights.